Download The King's Speech in Digital HD from the iTunes store. The King's Speech images are © Weinstein Company, The. All Rights Reserved. Oscar time is approaching and that means that many studios are re-releasing movies or trying their hardest to get those last few films out to audiences before voting time. 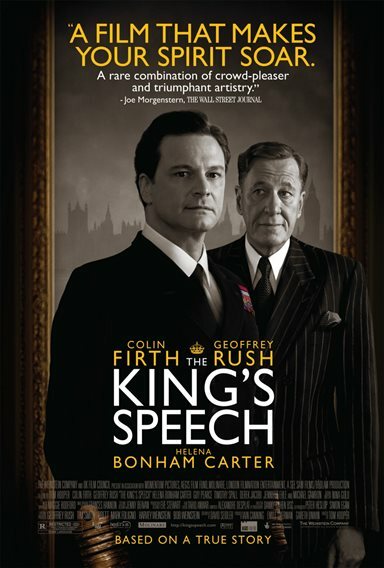 Among those films already in theaters is The King's Speech starring Colin Firth and Geoffrey Rush. The film takes place in the early years of the twentieth century in Great Britain and follows the adult life of King George VI played by Colin Firth. The movie opens as the King who is still the Duke of York and using his birth name, Albert, is about to make a public speech at the winter games. As he approaches we can see his growing apprehension at the thought of having to speak before the public. His wife, played by Helena Bonham Carter, sits off to the side and watches with extreme concern as her husband makes a disaster of what should be a simple opening monologue. This isn't something that has recently developed though, we learn that this ailment has plagued the Duke since he was a young boy and his wife being extraordinarily understanding has done her best to help him get past it. We watch, right near the opening of the film, as he sits with a doctor who insists that smoking will help him get past his stutter because smoke relaxes the vocal cords. When this fails as we know it will the Duke is willing to forgo the entire escapade but his wife is more stubborn than he realizes. She enlists the help of a local speech therapist named Lionel Logue, played by Geoffrey Rush, who uses some unorthodox methods to get the Duke past his stutter. As time passes and the lessons continue we don't see much improvement with his stutter but what we do learn is a little more about the Duke's family life and what, more than likely, brought about his stutter. His father, King George V, played by Michael Gambon, whom most of you will recognize as the recently deceased Professor Dumbeldore of Harry Potter fame; he comes off as a very stern and forceful father figure in a scene where he attempts to teach Firth the simple task of speaking in front of a microphone. The other aspect where Firth's Duke of York has trouble with his family is his older brother, Edward, played by Guy Pearce, who is obviously much more interested in the whiles of young women than he is in ruling over his nation one day. These aspects as well as the Duke's inability to see himself as a King allow for his stutter to persist rather than diminish. When it comes time for him to assume the throne all we can see is the inner turmoil that plagues him at the thought of having to go before the public and speak as their King. The backdrop for the film is 1930's London and as we know it was at this time that Hitler was ascending to power. So now, not only must the King declare that his countrymen go to war but also he must show an image of strength so that his people will be able to follow through with his decision to send them to battle. The performances in this film are spot on, from Geoffrey Rush's eccentric speech therapist who only wishes to see his King and friend succeed in what most others take for granted, to Firth's undeniably exquisite portrayal of a man who is unable to shake off the fears and troubles of his past. Helena Bonham Carter does a wonderful job playing the future Queen Elizabeth as a kind and loving wife who only wishes to see her husband overcome this troublesome malady that torments him constantly. But what stands out most in this film, is the growing friendship between two people who, on any other occasion, would never have crossed paths. The King's Speech is a great movie and a great way to start off a new year of films.